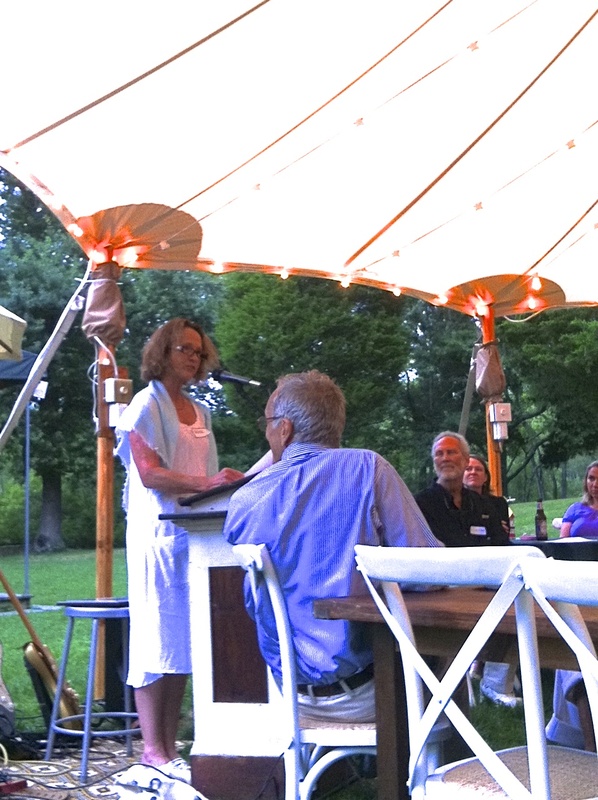 On August 18, 2013, the Tiverton Four Corners Art Center presented Dedee Shattuck with an Award of Recognition "for her promotion and support of local and regional artists and artisans in the FarmCoast area." All of us at the Shattuck were touched by this recognition. We are so proud of Dedee, and honored to be a part of her team, executing her vision for supporting a vibrant and visible creative culture in the FarmCoast. We thank the Four Corners Art Center, Roz and Jim Weir for their kind words, and everyone who joined us in celebrating Dedee's passion and vision for the arts in our community. "I, too , thank you all for coming out today to help us celebrate our arts center anniversary. Each of you is here today to support this beautiful corner of the world, keeping it open and rural, but more importantly, to support the concept of bringing people together to share a bond of appreciation for the arts. I would like to recognize one specific member of our community who has achieved public recognition for her very huge contribution to the contemporary art world. Dedee Shattuck, in just three short years has created a place for art to happen on a grand scale. I quote Bill VanSiclin, Arts Editor of the Providence Journal. "The Dedee Shattuck Gallery has quickly established itself as one of the top showcases of contemporary art in Southern New England." artisans who work and thrive here. Most remarkable about Dedee is her personal warmth and sincere interest in people. Dedee talks to people and listens carefully and accepts others' ideas. She first published a handsome book about local farmers in which she beautifully presents descriptive accounts and photos of the hard working people who are directly responsible for stewardship of the land and from there - on to the creation of her amazing gallery, a stately presence in which she herself listens and stewards by creating stimulus and a visible opportunity for artistic expression. which appeared in the Providence Sunday Journal a week ago which highlights the Shattuck Gallery and its ongoing exhibitions. And to that recognition, we add our appreciation of Dedee. So we welcome Dedee here today. You all know Dedee.... No need really to introduce her. Here, from the Four Corners Arts Center, is a small memento of our collective appreciation to you for your very energetic, consistent, and generous contribution to all of us. Thank you, Dedee." I want to thank Jim and Roz Weir for their foresight in preserving Tiverton Four Corners, and for this incredible honor tonight. Many years ago, a patrician gallerist asked me, “Why, on this good earth, do you want to open an art gallery?” Stung by his scorn, I defended my vision of a beautifully designed gallery, much like the Weirs’ Meeting House we are in this evening, which would bring even more inspirational artistic expression for our community to enjoy. But I felt the quickening of my time on this “good earth” and felt intense gratitude for living right here, amongst working farms, preserved lands, pristine bays, and world-class artists. I have had to find the balance between my shy reticence and my impetuous nature, my reserve and my passion, the luff and the heeling-hard, the wobble and the steady bike ride. I would like to imagine all of us here in this Meeting House, calling upon someone important in their lives, either past or present, to come together in one big Contra Dance: my son Will, arm-in-arm with my “dare to do” grandmother, and my son Ben, with his arm around the waist of my “just dive in” mother, and me, in Bill’s strong and loving embrace. Bow to your partner. Bow to your corner. Swing your partner round and round. Life on this “good earth” is short. So, let’s dance.